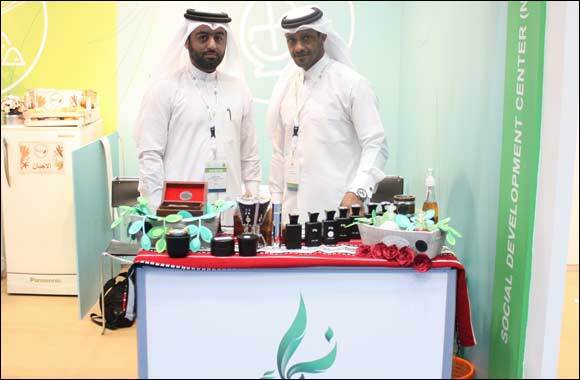 Doha, Qatar – March 22, 2017 - As part of its ongoing efforts to support young Qatari entrepreneurs and pave the way for them to reach their goals, NAMA Center, one of Qatar Foundation for Social Work’s Centers, has participated in the 5th Qatar International Agricultural Exhibition (Agriteq 2017), which was held under the patronage of HE Sheikh Abdullah Bin Nasser Bin Khalifa Al Thani, The Prime Minister and Minister of Interior, at the Doha Exhibition and Convention Center from 22 to 25 March 2017. NAMA’s participation in Agriteq comes in the context of highlighting the state of entrepreneurial projects in Qatar, and introducing the largest number of those interested or working in the agricultural sector, to the Center’s incubated projects that are related to agricultural products. As such, the Center has presented three projects run by youth and exhibited their various products (Perfume, incense, spices, cheeses, and food items), in order to introduce community members to NAMA's unique services to innovative owners of Small and Medium Enterprises (SMEs) incubated by the Center, as well as presenting and promoting those projects and products to the public. NAMA Center’s incubated projects are characterized by their diversity and are not limited to one business activity, with the Center directing its focus on the participation of entrepreneurs involved in innovative projects. In turn, the Center provides all necessary services and facilities without the owner incurring any financial burdens, in honor of their productive role in society. Participation in such major events is also an ideal way to boost entrepreneurship awareness in Qatari society, which is one of the key channels for human capital development that leads to the prosperity and sustainability of the Qatari economy and effectively contributes to the achievement of the Qatar National Vision 2030. Agriteq is an ideal platform for agricultural professionals, providing them with the opportunity to showcase their latest technologies and agricultural products, get together with experts to discuss market trends, meet with decision makers in state institutions, and provide participants with an opportunity to introduce and promote their products the public. It also provides visitors in the agricultural sector with the opportunity to learn about the latest agricultural products, as well as to meet producers and suppliers in this important sector. Since the launch of the Qatar International Agricultural Exhibition in 2013, the Ministry of Municipality and Environment (MME) has supported the entrepreneurial projects that have benefited from the services of the Center, through the provision of free promotional spaces to enable these projects to conduct business during the exhibition. It is worth mentioning that the Exhibition contributes effectively to the integration of incubated projects into the local market, enhancing the culture of business management, raising the community’s awareness of this sector, as well as serving as an invitation to decision makers in the country to develop a special support system for these projects, in which both the Public and Private Sectors can participate.